It's going to be tough for Elche to play Atletico Madrid in the Copa del Rey as they are one of the top teams in the Primera League. However, Atletico are not at their best and are having a bit of a goal drought (let's hope this doesn't end tonight!). Diego Simeone addressed the media before Atlético Madrid take on Elche and said the anxiety caused by Atlético’s lack of results in front of goal only makes things worse. “ The goals come at specific moments and we have the players that can take them. We just have to hope the ones that are going out will go in next time! The return leg will be played in Madrid next month, so we need a strong result at home. 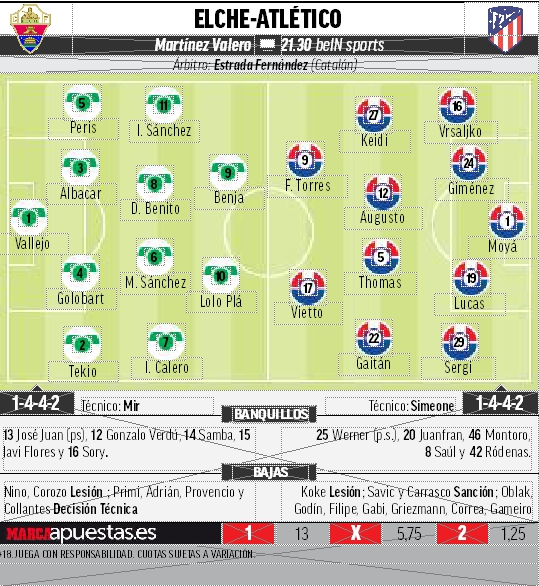 The photo shows the Marca pundits' expected XI. Photo courtesy of Marca.